Well chow chow in india is called Banglore Brinjal. The botanical name is Choyate . ( source from wikipedia ) Tastes like cucumber but little bit softer in texture.more to say my hubby wasn’t happy when I said the name but when I served him he emptied the pot. Peel the skin & grate the chow chow. Mix yoghurt, salt, chopped cilantro & grated chow chow. that is so simple.. never knew we can eat raw chow chow. 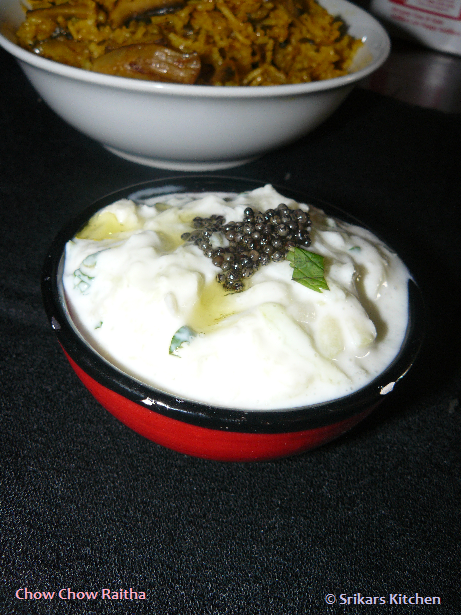 something new with chow chow..nice recipe..
raita looks yummy Srikar's... delicious. U don't need to cook, very cool ur recipe! Nice recipe..a gift for you.... Check out my blog for a surprise. i wasn't aware that chow chow can be used raw in recipes. I've never had it raw in a raitha.. i must try this! Something new (being in Bangalore i never heard of this). Simple and nice recipe. hey that was an out of box thinking ... will surely try it out ..
hey this is just awesome, simple and delicious!!! I do not like chow chow,but yours is simply tempting. We call as 'seme badanekayi' in Bangalore/mysore region :). Very yummy recipe, never made anything with raw chow chow. Raitha looks delish.